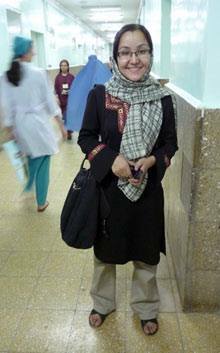 After completing her training at Mashad Medical University in Iran, Sabera Turkmani provided reproductive health services to refugees from her native Afghanistan. Since returning to her home country, Sabera has worked as a midwifery trainer for the International Medical Corps, has served as technical advisor for John’s Hopkins Program for International Education in Gynecology and Obstetrics (JHPIEGO) pre-service midwifery education, and is president of the Afghan Midwives Association (AMA). The AMA was formed to support Afghan midwives, raise awareness about safe motherhood, and improve country-wide education and practice policies – the main focus of Sabera’s career. Sabera and the AMA are also working with the government to achieve three of the eight UN Millennial Development Goals: improve maternal health; reduce child mortality; promote gender equality and empower women. In this article, Sabera discusses how helping women achieve safe and healthy pregnancies ties in with fighting malnutrition: http://www.aljazeera.com/indepth/opinion/2012/10/2012101192945904516.html.